NORTH ROBINSON — With a victory over Upper Sandusky on Friday, at home, the Eagles will likely find themselves playing in Week 11 of the high school football season. The Eagles were No. 6 in Region 22 of this week’s computer poll. The final poll will be released Sunday. The top eight teams in each region qualify for the playoffs. With last week’s 34-6 win over Buckeye Central, the Eagles improved to 7-2 overall and 5-2 in N-10 play. The Rams are 4-5 overall and 3-4 in the league after getting blown out by the Wynford Royals 53-0 last week. In the Eagles’ win, they racked up 373 yards of total offense. Trevor Shawber carried the rushing load, finishing with 149 yards on 21 carries and three touchdowns. Blake Treisch rushed the ball 13 times and picked up 111 yards and a score. Of the total yardage, 316 yards came on the ground attack. Quarterback Hayden Bute attempted just seven passes for the game and completed four for 57 yards. Kaleb Landin had two catches for 40 yards, Owin Seevers snagged one catch for 12 yards and Treisch had five yards on one catch. Defensively, Crawford allowed just 218 total yards; 146 rushing and 72 passing. North Union overwhelmed Galion in Mid-Ohio Athletic Conference Red Division action last week, 41-3. The Wildcats ran out to a 20-3 halftime lead and shut out the Tigers in the second half while scoring three more touchdowns of their own in the third period. The Tigers offense was led by Chase Cooke, who completed 14 of 29 passes for 126 yards on the night. Cooke was also the rushing leading for Galion with 20 yards picked up on five carries. Leading receivers for the Tigers were Harrison Ivy, Takoda Crisman and Isaiah Alsip. Ivy had six catches for 68 yards, Crisman caught one pass for 28 yards and Alsip snagged three grabs for 25 yards. The running game for the Tigers only picked up 43 yards on 14 carries. GALION — Winless Northmor is at home Friday night vs. the winless Elgin Comets. 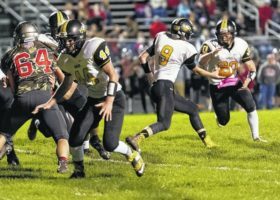 Northmor lost 22-14 vs. Fredericktown in Week 9, while the Comets were overwhelmed by East Knox, 83-34. Against Fredericktown, Northmor gained 224 yards, the majority via the ground game. The Knights rushed the ball 36 times for 156 yards and one of their two touchdowns. Through the air, Northmor was just 9/21 for 68 yards and one touchdown. CRESTLINE — Crestline will close out the season on Saturday in Fostoria against the St. Wendelin Mohawks. St.Wendelin sits at 3-6 overall this season. Crestline is ending the season on a four-game road trip. Last Friday, the Buldogs were in Loudonville. The Redbirds won easily, 44-7. Crestline dropped to 3-6 overall. In that game quarterback JR Wolfe was the leading rusher for the Bulldogs with 57 yards on nine attempts and scored the lone touchdown for his squad. He also added the extra point, making him responsible for all seven of the Crestline points. Wolfe was 8/19 passing for the game, good for 65 yards and an interception. Caleb Moore was one of four receivers with at least one catch. Moore had one grab for 24 yards to lead all receivers in yards. Chandler Gaskill and Ty Clark had three catches apiece for 20 and 18 yards respectively. Davon Triplett had the other reception on the night, gaining 18 yards on the catch. Northmor punt returner (No. 23) returns the ball to the Fredericktown 10 yard line after the Freddies’ first possession of Friday night’s game. The return led to a Northmor touchdown. Photo by Don Tudor. http://aimmedianetwork.com/wp-content/uploads/sites/38/2016/10/web1_Northmor-FB-102116-2.jpgNorthmor punt returner (No. 23) returns the ball to the Fredericktown 10 yard line after the Freddies’ first possession of Friday night’s game. The return led to a Northmor touchdown. Photo by Don Tudor.